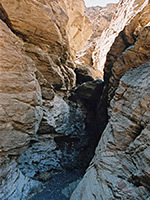 West of Grotto and Mosaic - the two most visited narrow canyons on the north slopes of Tucki Mountain near Stovepipe Wells - the ravines become gradually shallower, though still with dryfalls and enclosed passages. 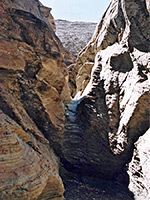 One with a semi-official designation is Stretched Pebble Canyon, the third drainage after Mosaic Canyon, and which is named after a layer of conglomerate found in the walls that contains pebbles and boulders distorted by metamorphic activity. 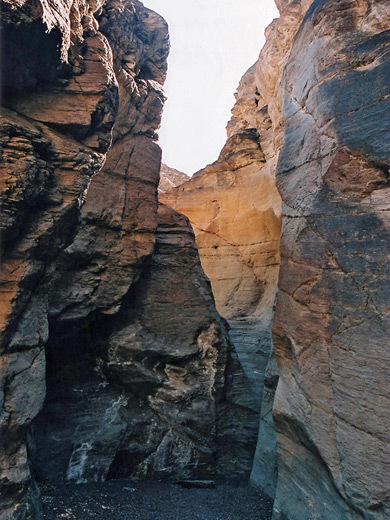 The canyon climbs at quite a steep gradient and has frequent dryfalls up to 20 feet high, usually with a narrow passageway below and a wider section just above, and is quite pretty, though rock climbing skills are needed to progress very far. The mouth of Stretched Pebble Canyon is not obvious from highway 190 and as there are several others close by, some care is needed to locate the correct one. The place to park is at the side of the road about 5.8 miles north of the turn off to Emigrant Canyon, in sight of Stovepipe Wells village but still 3 miles from it and 1,000 feet higher in elevation. TopoQuest topographic map of Stretched Pebble Canyon (ravine begins at the 'M' in Monument). From the highway, the hike to the canyon involves walking perpendicular to the road up the gently sloping alluvial plain, heading southeast towards an opening in the cliffs just to the right of a small protruding ridge. There is not much of interest to see at first, though a quarter of a mile from the road and parallel to it is the course of the long disused Skidoo to Rhyolite telephone line, still quite evident in some places by posts and wire. 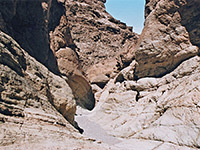 The route to the canyon intersects the wash that leads to the narrows, about half way between the road and the hills, though all the surrounding land is quite similar, with many criss-crossing flood channels between piles of stones and boulders. The sides of the wash rise a little near the opening in the cliffs, better defining the main channel, and where the wash meets the edge of the mountains (1.5 miles from the road and 400 feet above it), the channel constricts quite suddenly and the wash winds up the rocky slopes between mostly sheer walls, at a fairly constant gradient. The wash twists and turns through upwardly trending passages interrupted by frequent dryfalls. Some are quite easy to climb, a few can be bypassed using ledges at either side but many are more difficult; some of the falls are topped with overhanging chokestones while others are formed by smooth vertical chutes, polished smooth by the waters, and tend to have few handholds. Overall, the canyon is interesting enough, has unusual, varied rocks - strata of varying thickness at different angles, alternating with patches of the stretched pebble conglomerate - and is continuously narrow, just never very deep owing to the steepness of the hillside.